It's always been a challenge for me to eat my vegetables. I've always loved fruits and hated veggies. I wish I were a salad guy, but I'm not, so I've found a new way to eat green vegetables every day. I throw them in a smoothie. My wife started doing this when she became pregnant, and I finally decided to join her. Now I love it and it's become a daily ritual. 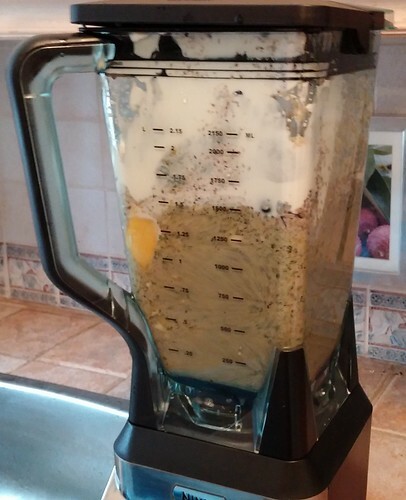 First, everything goes in the blender. 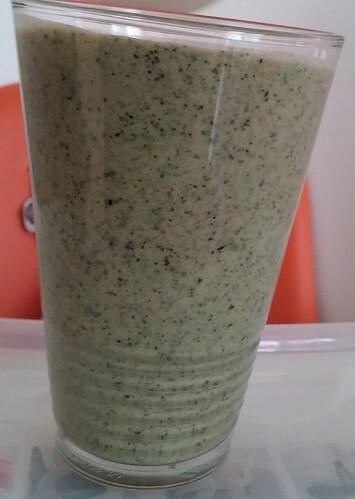 Yesterday we had kale, spinach, mango, blueberries, oranges, banana, greek yogurt and flax seed. And ice, adding ice at the end makes it better. Then, we drink it. It's yummy! Kale is a staple of our smoothies, because of its many health benefits, but we'll add different vegetables depending upon what's in the fridge. The other day we added broccoli. If you're like me and you just don't like broccoli, this is definitely the way to go. Can we get an after shot please? Mike I believe you have a deadline for reaching a certain amount $2500.00 ? Suggest you need to highlight this on a daily basis to wake some people up!! I have some time before the deadline, so I'll highlight this again next week and get people moving. The key point I haven't made yet is that I won't be asking for Terry Fox Run pledges this fall, so this is the only time I'll be seeking donations in 2014.
broccoli.. try blanching them..then cool them in the fridge..then toss olive oil, balsamic vinegar and some salt and pepper..
also you might want to try these..pretty good..
-Melt the chocolate chips for 30-60seconds in microwave until mostly melted. -Combine with honey, peanut butter or almond butter, vanilla and mircrowave for a minute and stir evenly. - baking dish coat with PAM or olive oil just a bit. Looks good! What brand of blender do you use and are you happy with it? It's called Ninja... my wife loves it. My wife has been making similar drinks for us for the last several months, and aside from the health benefits, I do believe it's helped us shed a few pounds as well. 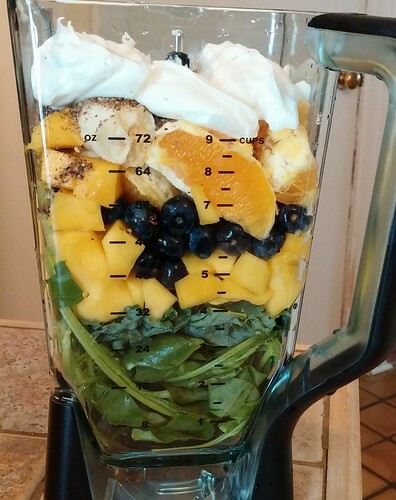 She uses kale, spinach,etc and initially the thought of drinking a salad at 9 in the morning was a bit revolting to me, but they are fantastic when she adds blueberries or other fruit. And, she makes them in a Nutri Bullet which is even better than a blender since there's less mess. At breakfast I also have a bowl of wholegrain Cheerios, but I'm now considering dropping that and just having the drink, but there's some simple childhood pleasure associated with cereal so I'm not lettin' it go quite yet. we purchased the Ninja as well..far less expensive then the Vitamix or blentec..and works pretty damed good. I am very skeptical that this tastes good. @ Corey - I'm with you...I'm not sure how this tastes good. But since I am on a massive health kick...trying to change my lifestyle. I will give Mike's concoction a shot. ....I'll let you know how it goes.. The fruits make it taste good. Trust me. All you taste is the banana and orange! So Mike, is this (or could it be) a meal replacement, or is it just a supplement to get your daily veggies? I've been drinking it as a dessert replacement.... but it is rather filling. Hey Mike! Try using black Kale. More good stuff than plain Kale. I don't mind veggies at all, but just find it hard to find time to cook properly every night. We were given a Magic Bullet for Christmas, might be time to dust it off and give these things a try.